Rift has arrived. Oculus announced in a blog that it had begun shipping its virtual reality (VR) headset first to those who invested in its idea through Kickstarter. Next, pre-ordered Rifts will ship out, starting "mid-week." Everybody else will have to hold on until July. That's when the $599 units are expected to be available through the Oculus shop online. Or customers can choose a bundle that includes the headset and a gaming-caliber PC (most sans monitor) from Microsoft and Best Buy. A few hustlers have also listed their Rifts for sale through Amazon for prices ranging from $1,200 up. It's been a long wait. The Kickstarter campaign to seed development began in August 2012, when a small group of developers promised to transport people to an immersive environment alongside others. That successful fundraising effort pulled in $2.4 million. 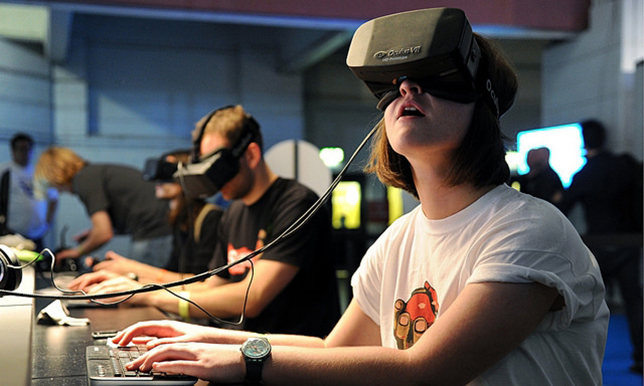 Less than two years later, in 2014, Mark Zuckerberg announced on Facebook that his company would be acquiring the Oculus team and its technology for $2 billion. "This is really a new communication platform," wrote Zuckerberg at the time of that acquisition. "By feeling truly present, you can share unbounded spaces and experiences with the people in your life. Imagine sharing not just moments with your friends online, but entire experiences and adventures." The Rift launches alongside 30 games in the Oculus experience store. Each unit will include Playful Corp.'s Lucky's Tale, about a "fun-loving fox." Preorders also come with space battle game EVE Valkyrie. According to coverage on The Verge, other games include puzzlers, simulators and racing programs. Video content, including Facebook 360 videos and Vimeo and Twitch livestreams, will also begin to surface "soon," the company said on its site. But it's the potential for applications that go beyond gaming that also intrigue educators. The 2016 Higher Education Edition of the NMC Horizon Report called VR (alongside augmented reality) one of the most important developments in education technology for higher ed over the next two to three years. Boise State nursing students are learning to perform catheter insertions with VR headsets, which are less expensive and more compact than medical mannequins. "These technologies are poised to impact learning by transporting students to any imaginable location across the known universe and transforming the delivery of knowledge and empowering students to engage in deep learning," the report's authors stated.